Service is what it's all about. Quality service, done right the first time. Here at Vaughn's Power Equipment, we offer the highest quality service using OEM parts for your commercial lawn equipment as well as agricultural and construction equipment. Vaughn's Power Equipment have over 50 years combined experience (not to mention the other technicians) and it shows in the quality of their work. WE NOW OFFER GIFT CERTIFICATES FOR ANY DENOMINATION AND FOR ANY OCCASION! 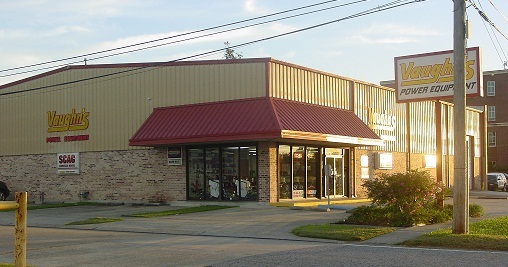 Family owned and operated for over 30 years, Vaughn's Power Equipment in Kenner, Louisiana is your source for the very best in professional outdoor power equipment. We truly cater to our customers and take care of them above all only working on what we sell. We feature a wide variety of dependable, reliable outdoor power equipment, geared for the commercial cutter and landscaper who demands quality. Names like Scag Power Equipment, Snapper, RedMax, Kohler Engines, Husqvarna, Wright, Billy Goat, Whipper Clipper edgers, and Trimmer Trap racks, Honda small engines and parts, and more. We can satisfy all your outdoor power equipment and accessory needs! Our Parts & Service departments are a key part of our commitment to customer satisfaction. We don't just stock parts, we are an active distributor for many brands. If you need a part, we've got it. Stop by the store on Veterans Blvd, or contact us with any questions about your current power equipment, or your future machines! We ship local and nation wide daily!